The ideal box for storing seashells, rocks, and other treasures collected while on vacation! 1. Gather your material. You will need a shoebox, yellow Fun Foam, white glue and/or hot glue, blue poster paint, blue finger paint, tiny seashells, scissors, a paintbrush, glitter glue, adhesive Fun Foam letters (not shown), an elastic hair tie, and a wooden bead. 2. 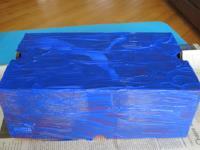 Paint the shoebox using the blue poster paint. If your box is dark like mine was, you may need two coats of paint. Let dry. 3. 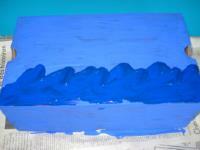 Apply blue finger paint at the bottom of the lid and use your fingers to create waves. Let dry. 4. 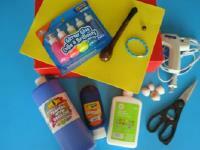 Cut a circle out of the yellow Fun Foam and glue it at the top of the lid to represent a sun. 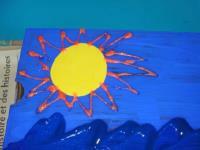 Use orange glitter glue to draw the sun's rays. 5. 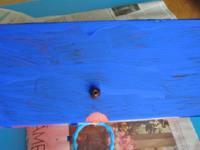 Glue the wooden bead on the side of the box. Glue the elastic hair tie on the lid, close to the edge so it can be looped over the bead to keep it shut. If you are using a shoebox that has a lid that can be completely removed, you may use a bead and an elastic hair tie on each side. 6. 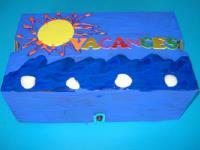 Use the Fun Foam letters to write "Vacation" or "Memories". 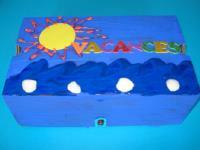 Add a few seashells and your box is ready for summer vacation!